I’m always so pleased at how my tee shirts come out! 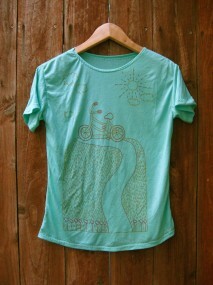 These shirts were all made for markets and Etsy, so pick one up for yourself! Many thanks to Lorraine for modeling on our trip to Seattle. 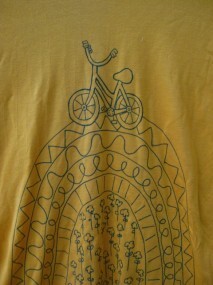 This is a “re-issued edition” of the original bicycle shirts. 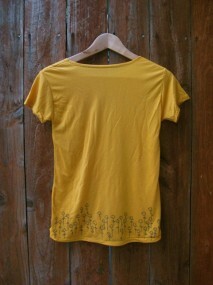 I really love this yellow fabric; in dimmer lighting it takes on a gorgeous warm tone that can’t be captured. 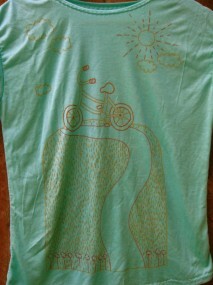 And another bicycle tee. It’s got a design very similar to this earlier shirt, but of course since I drew it myself there are little differences. I’m very excited about these mushroomy shirts! I love mushrooms in so many ways. There’s the green shirt with the orange drawing as well as a light grey shirt with aqua fungi and I’m not sure which one I like more. As always, every drawing is done by hand, so they are always unique. 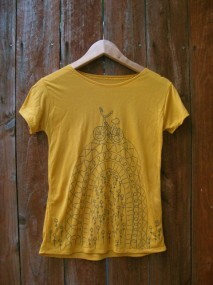 I made my own tee shirt pattern that looks great on everyone. I use a fabulously soft and silky jersey from Fabric Planet that is a dream to wear. 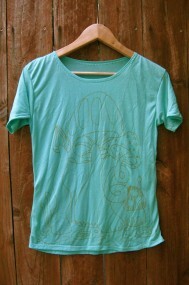 The shirts are free sized, meaning they will stretch and drape to accommodate and flatter your figure. On another note, I can’t quite decide for myself between “tee shirt” and “T shirt.” I need to have a standard format for my website and Etsy shop. Any opinions? I was interested in the jersey fabric from Fabric Planet but when I went to the website they don’t have that category even after doing a search they said they don’t have it. Is it called something else?